Oops - we don't appear to have a video for the Mobility. I haven't had a great deal of use of it to date but from what I have done with it so far I find it does the job exactly what it was bought for. On Trade Scanners themselves I can only say that the service I received from Andy Stott was excellent and he went over and above what could be expected in securing me the scanner. Experience the Freedom of True Mobility - scan without a Computer, Cables or Software! What is mobility? It means easy-to-use technology that is flexible enough to use anywhere you are, un-tethered, fully compatible with your lifestyle. It means reliable and affordable information capture at your fingertips. An integrated device which is small in size but high in performance, and environmentally friendly too. Until now, scanners have been, at best, portable. They were small and easy to travel with, but now it's time to think about mobility in a whole new way. Scan to smartphone, Micro SD card* or USB Flash Drive. 300 dpi simplex scanning in colour or black & white. Your scanned PDF and JPG files can be read by any computer. Rechargeable battery, scan 300 pages per charge. AutoLaunch™ - scanning begins as soon as you insert the page. Scan to smartphones and mobile devices that support mass storage. Scan photos to Micro SD card and insert in digital photo frame. Upload photos to iPad™ with Apple® Camera Connection Kit (not included). Wireless Scanning to your computer or Evernote® with Eye-Fi® card (not included). Scan documents, receipts, photos, business cards, plastic ID cards… anywhere! Introducing Visioneer® Mobility, the first truly mobile scanner that lets you scan anywhere without a computer, cables or software. You can even scan to your smartphone using the USB cable supplied with your phone. 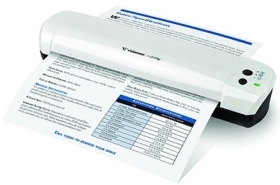 Visioneer Mobility is a small colour scanner that is powered by a rechargeable battery. No computer or power connection is required to start scanning. Simply turn on the scanner, select one of three file formats (Colour PDF, B&W PDF or Colour JPG), and insert your document. Your scanned items are saved to an Micro SD memory card (1GB card included) or a USB flash drive. Alternatively, if you attach the scanner to a smartphone, your scans are saved to the phone's internal memory. Mobility can also scan your documents and wirelessly transfer the scanned JPG files with an optional Eye-Fi® card (not included) inserted into your scanner. Eye-Fi is an SDHC memory card that has built-in Wi-Fi. It stores the images on your card and uses your wireless network to effortlessly transfer these images to your computer and over 25 online destinations such as Evernote®, Picasa™, Facebook™, Shutterfly® and MobileMe™. Don't run out of space on your Eye-Fi card with the Endless Memory feature that automatically makes space when your images have been safely delivered. To learn more, visit www.eye.fi.